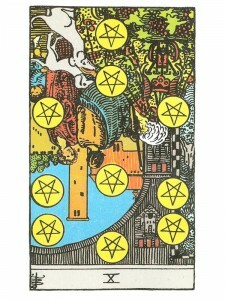 Ten of Pentacles (R) says acknowledge when you are experiencing one problem after another, when nothing seems to run smoothly – when you feel lost and do not know what to do. When you become bored – you lean towards doing nothing and you can easily be persuaded to go in the wrong direction. If this sense of boredom increases – it can lead to taking financial or emotional risks – recognize that this urge to gamble everything, stands in direct opposition to your basic qualities of caution, skill and foresight. Sometimes a risk is justified, depending on the projected results – but, if the risk comes from impatience, then troubles can arise from recklessness or doing things at the wrong moment. You become so trapped by the need for material comfort that you become security conscious and the advancement mentality necessary for continuous growth. Become self-motivated – be objective and take command of this situation. Utilize your gifts of communication, healing and inspiration and align with your “inner” Self. Organize things in your life – begin to communicate your “inner” desires and the results will be healing, inspirational and enriching. Difficulties deriving from bountiful blessings – physical prowess/beauty or material possessions. Problems with inheritances appear. Lack of true appreciation for the magnitude of the material blessings. Improper/inadequate use of wealth. Fortune atrophying, need to invest. There is no concern of factoring in here of how many carcasses were strewn along the way to achieve such material success. At one extreme – this can even be a mafia godfather kind of ending in which one’s own family ends up well off and very secure, but nothing is said to the families of others. In another example – placement of one’s self and one’s men in the castle built with hard and just labor of an enemy of the Christian God. In what ways are you wealthy? What traditions are you carrying on? What are you inheriting – a job, money, home? What do you owe to family influence? What is your status or position in the hierarchy or structure? What will endure beyond this experience or situation? How are you expected to behave under these circumstances? Next to Sun or World: You will know fulfillment and true happiness. Next to Lovers with Ace of Cups in the spread: Celebration, union and great joy are indicated. Devil and Tower with Two Aces in the spread: Upsets – problems with business or career. Other people are involved – you need to make fresh plans and focus on a new start. In the first position: A gentle reminder: This path, for all its obvious advantages, has no more and no less than any other, given your complete Karmic Contract. It may fall to you to hold an aging system together. In the second position: Generally, there has been much in the way of physical and material resources, but there may be a hitch somewhere. Maybe it is time to review the troops, inspect the warehouse. Are the resources you have well-suited for the situation at hand? In the third position: At one extreme – there may be a need for a second line of defense in your material world. Contingencies should be readied. At the other extreme – the possibility of an unexpected boon such as inheriting a house or substantial estate. In the fourth position: The things that can go wrong with dreams made up of fairy tale stuff. At one extreme, there is the obvious problem of over idealism and unreasonable expectations. At the other extreme, there is the little girl with no dream, with no vision that anything approaching such well-being and happiness is remotely possible. In the fifth position: There may not be as much material support from or for your family as you were counting on or you may be planning a major reworking of finances. In the sixth position: Actions, reactions may be in the extreme here. In the seventh position: Might you be scuttling your own expectations? Could this be fear of wealth, of being and looking successful? Can you handle it? Will it change your beliefs? In the eighth position: What you have achieved is shocking by its excess or what you have achieved has fallen short of the mark. In the ninth position: In one extreme, there is concern for family well – being. In the tenth position: It will be a whole new world you are looking at. At one extreme, cracks in the financial foundation or the area of health care, that require immediate attention. At the other extreme, expansion and success to be coped with.